It’s that time of the year again. 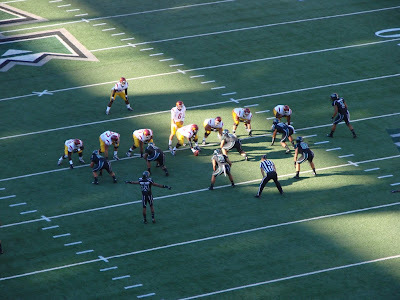 The University of Hawaii Rainbow Warriors opened their season against the mighty USC Trojans of the Pacific-12 conference. This type of game always is a mixed bag for me since I am born and raised in Hawaii but I did spend my college years at USC. I tried to time the photo of the day to be of the Warriors drive but whenever they got close to the end zone it was on the opposite side of the field from me. In the end the Trojans were too much and took at 30-13 victory though the game ended on a high note with UH connecting on a 60 yard touchdown pass. Here’s hoping both school have a great season. Over the weekend I dropped by for the Taku Taku Matsuri festival since some of my friends were helping out there. It was at the Hawaii Kotohira Jinsha Dazaifu Tenmangu temple (try say that three times fast). 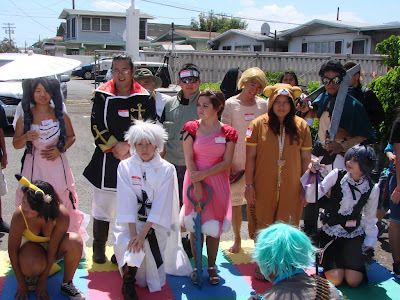 The festival run by volunteers in Hawaii’s anime community, consisted of several food booths as well as booths selling anime related items and artwork. One of the main events was the Cosplay Chess which uses people dressed as anime or video game characters as human chess pieces. There was quite a crowd watching so I had to maneuver myself to get this photo. For those interested in Hawaii anime community you may also want to check out Oni-Con Hawaii, Kawaii Kon Hawaii or the Otaku Ohana blog by Jason Yadao. Time to wrap up our Sea Life Park series and it seems the best way to do that is with the dolphins. 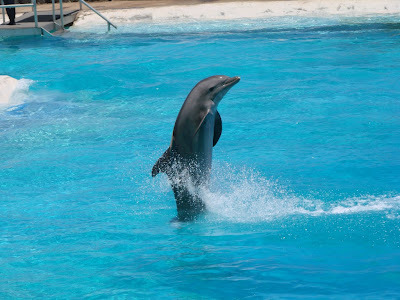 Above is one of the dolphins “moonwalking”. Wouldn’t it be awesome if we could do that too. 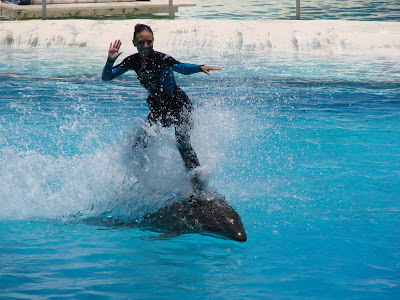 Below is one of the trainers surfing on the dolphins. The park also provides opportunities to interact up close and swim with the dolphins and sea lions see their website for pricing. Hope you enjoyed our series the park is open daily from 10:30am to 5:00pm. If you want to see all the shows you will probably need most of they day especially if you sign up for any of their interactive programs.